Cynical, world-weary, and slightly sarcastic. 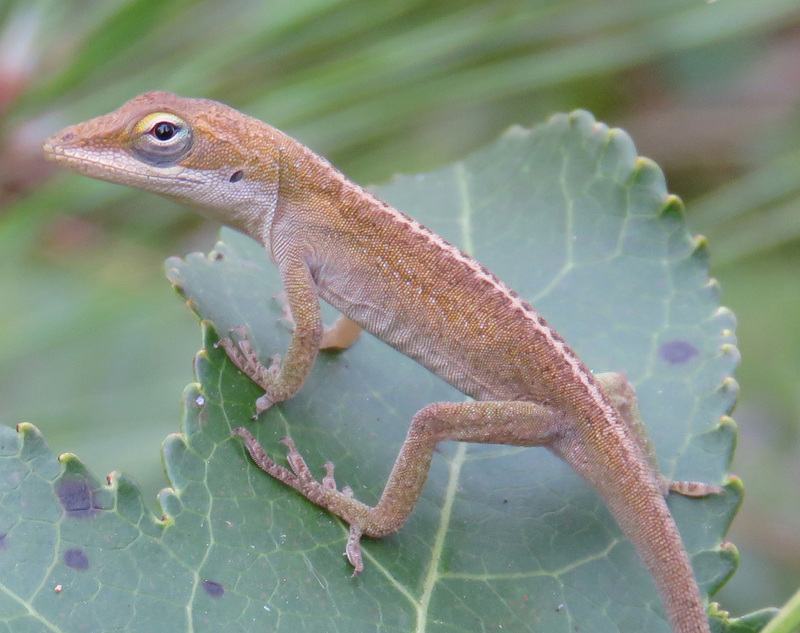 Here in the Houston area, we have these little anole lizards everywhere, basking on fence posts, leaping through rose bushes, surveying their lizardly kingdoms from tree trunks. I have lived here for almost 40 years, and every time I see one, it regards me with the exact same facial expression — a little evaluating tilt of the head and a cold eye of cynicism for the new kid on the evolutionary block. Being around humans makes them miss good ol’ T. rexes. My two year old daughter loves lizards. 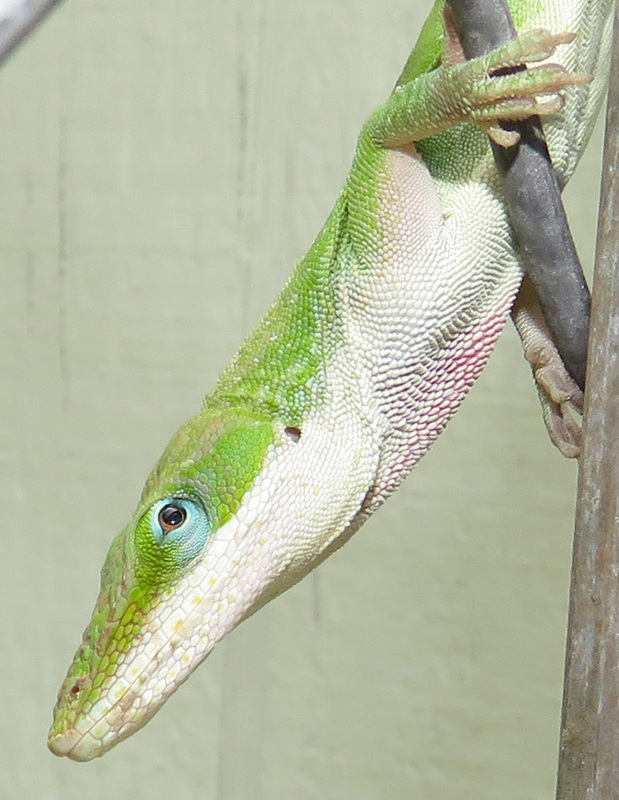 We spend hours outside scouring the bushes, fences, poles, and side of the house in search of the reptiles. She squeals with delight when she sees one and wants to get closer. The lizard has no such desire to get closer and seeks higher ground. 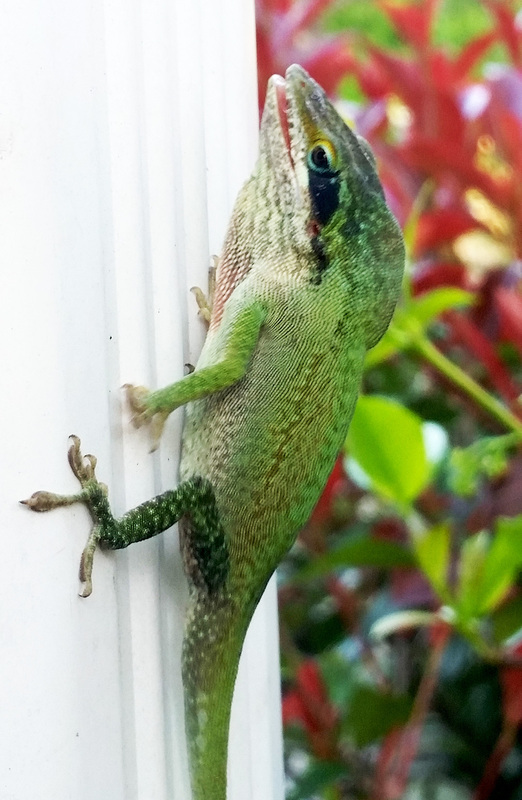 In the course of these near daily hunts, I have actually started to recognize the anoles that live around our house. It turns out that the reptiles are pretty territorial which isn’t all that odd once I started to think about it. I must confess that until my daughter, I didn’t give them a lot of thought! There is one lizard in particular that we have come to know. 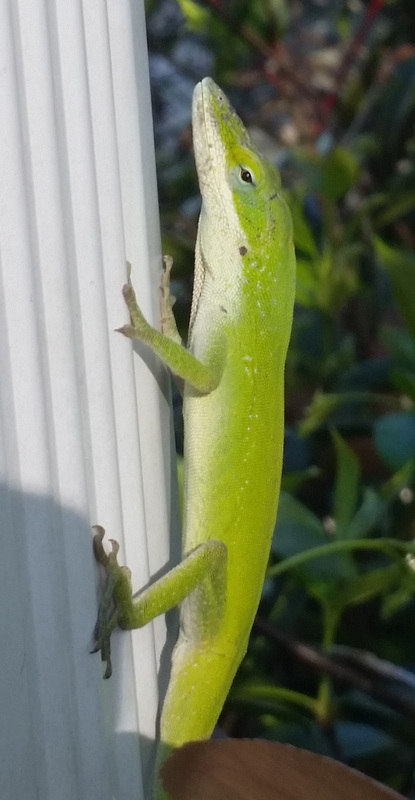 He lives in the Star of Jasmine bush that vines up the gutter down spout by our back door. He is very recognizable due to his partial tail; a scar caused by one of our many cats, I’m sure. One afternoon, I noticed some movement in the bushes and brought my daughter over to investigate. What we saw was so surprising that I rushed inside to get a camera to snap some pictures. I just knew that my like-minded nature loving neighbor would want to see this. 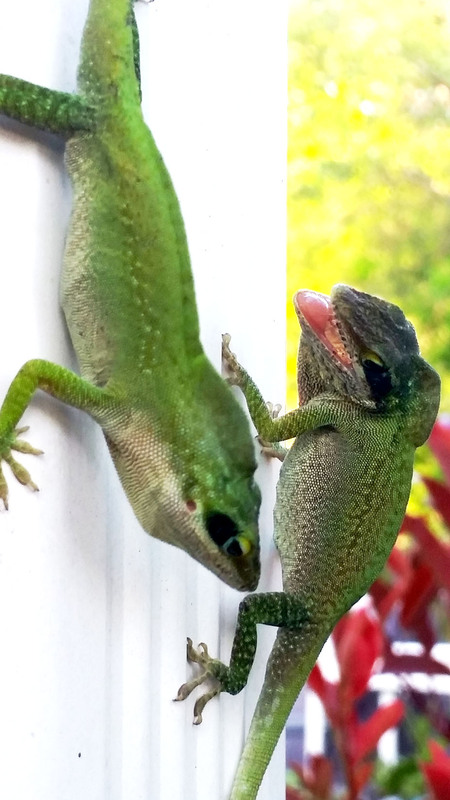 There are the porch railing were two anoles locked in battle. They had clamped on to each other’s mouth and had no intention of letting up. My daughter, son, husband, and even my mom huddled around to see the strange sight. 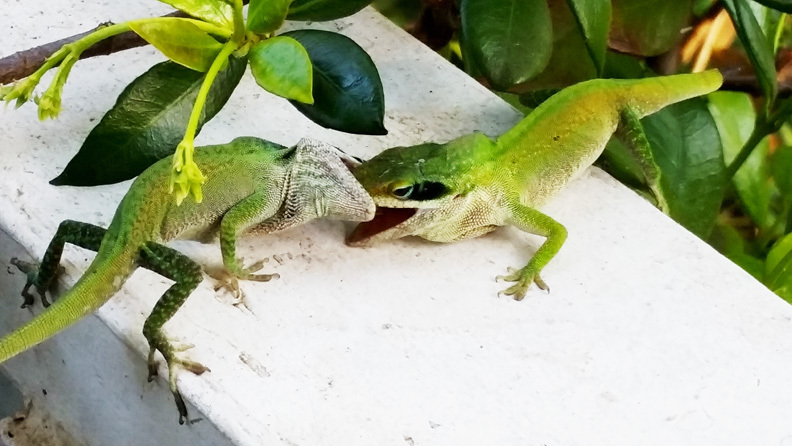 We are used to the lizards running away as soon as we get close but here we are standing less than a foot away but they could not be bothered by us; there was a battle to be won. Will they stop at posturing and bluffing? There was flipping and thrashing. It was quite brutal. When they finally released, I foolishly tried to shoo them apart but neither one would be deterred. They sought each other out and completely ignored us. The most shocking discovery was the physical transformation that occurred in both animals. 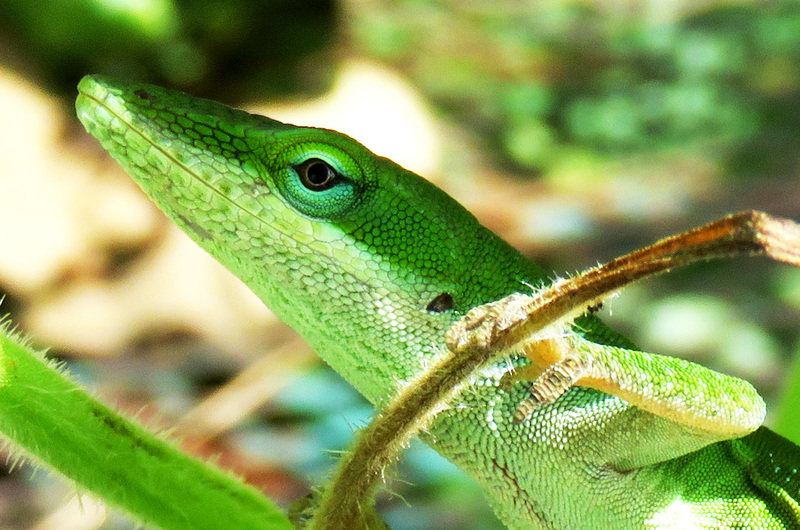 Although not a true chameleon, the Green Anole is able to change color and appear as green or brown, depending on its surroundings. But in this scenario, they adopted a more primitive look. 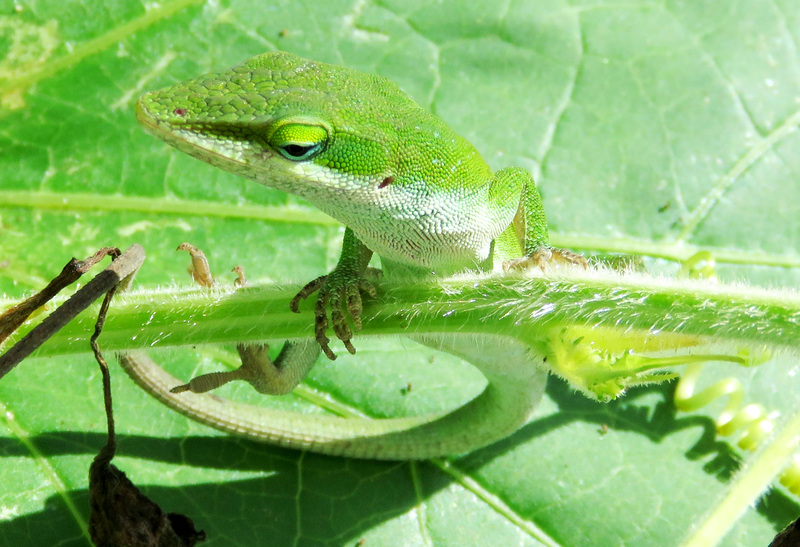 The normally smooth green skin took on a more mottled pattern and a black spot that is not normally there appeared around both animals’ eyes. The most intriguing transformation was the ridge that appeared behind the head and continued down their back. The winner and rainspout champion. The battle continued for over 30 minutes until we finally lost sight of them in the bushes. 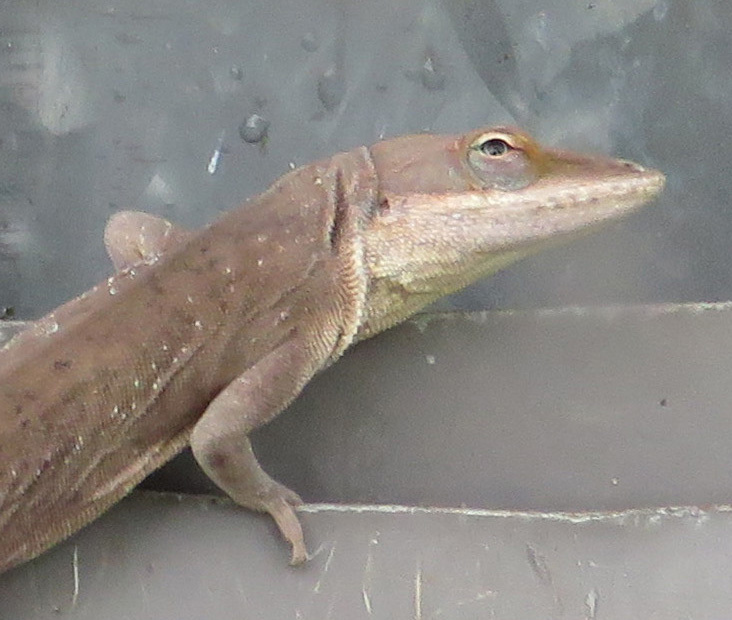 We know “Stumpy” came out on top because he is still seen lurking around the down spout, lording over his vast domain. I want to thank EcoCaty, not only for sharing this story with us, but for being such an outstanding mom who is willing to patiently follow her children’s lead in exploring nature! I love learning something new about nature and I love seeing the next generation become fascinated by it too. This evening Jim and I IDed a couple of yellow rumped warblers in the trees behind our house. It isn’t one we’ve IDed before, though we saw one several days ago. New for us! And today I heard a catbird for the first time this year. A good day! I love when a new species shows up for the year! Or one that has probably been here all along, but I just now figured out. I have one reptile book that cover the US, but my snake book is specialized for Texas. Don’t those localized books make it so much easier to ID a species! Holy cow! These are great photos–they look totally prehistoric and scary. Personally, I like them better insouciant . . . . Thank you for allowing me to share! And thanks to my kids for helping me to spend more time in nature!